During the second round of the 2017 U.S. Women's Open, Fox Sports analyst Brad Faxon brought up a fantastic point. Playing the par-4 5th hole at Trump Bedminster, So Yeon Ryu chipped onto the green and watched her ball slowly track toward the cup and then ... stop. Her ball rolled into her playing partner's ball mark, hopped into the air and lost its momentum. "You know what?" Faxon said. "Everybody out there, stop being selfish and marking with your big, favorite casino coin," he said. "Put a penny on the ground. … I can't stand it." 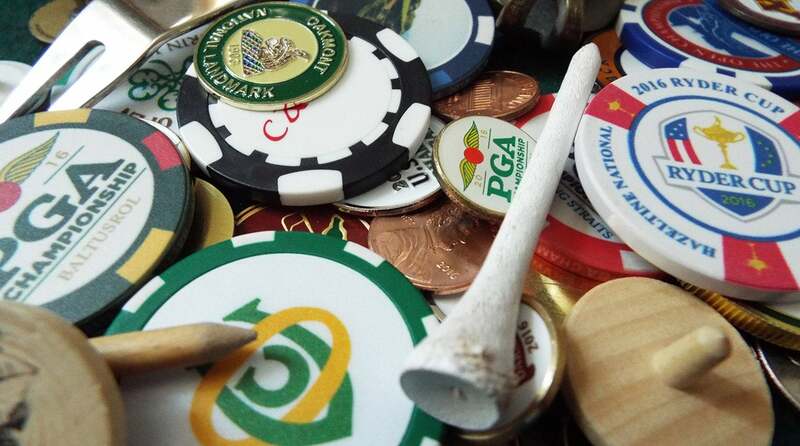 We hear you, Fax, yet ball markers should be more than just coins or throwaway souvenirs you grab from the pro shop. They ought to be statement pieces. They should tell stories about you: your hometown, home club, favorite course, favorite team. So which marker type reigns supreme? Behold, the definitive ranking of 21 common markers, plus what each marker says about its owner. Some are functional. Others not so much. But if you don't have at least one of these, do yourself a favor and pick one up, because the guy or gal who borrows a marker on the 1st green is the absolute worst. C'mon, you're not even trying. You're a simple person. And cheap. You were recently in a wedding party. You love gambling, standing out and being obnoxious as hell. You're about as interesting as a DJ press conference. Old-school cool. But fair warning: You'll do well to play 18 without losing it. Simplicity at its finest. Not cheap like a penny, nickel or dime. Plus, this is close to the perfect size for a marker. By the way, do you pay attention to which side is up? If you do, then you're channeling your inner-Tiger Woods! These are slightly better than normal poker chips because they have a golfy flair. But some would argue that these are better suited as paper weights on your office desk. After all, as Fax noted, your partners would appreciate not having to putt around this behemoth. It's all good, though—just be conscious of your partners' lines and no one will get hurt. Any team but the Browns. Sure, The Greenbrier or John Deere aren't exactly circle-me-on-the calendar Tour stops, but they can still strike up a conversation about your golf travels. Only acceptable if you belong to the club. You are a big supporter of your school and want everyone to know it. Mark that ball with pride! Not as prestigious as the Masters or Opens, but bonus points if it's from a year when you attended. That way you can tell your pals, "I got this on Sunday when Y.E. Yang beat what's-his-name at Hazeltine." Bandon? Streamsong? Kiawah? Go on with your bad self! Must you rub it in that you have a locker at Cypress Point? All right, we would too. A keepsake, especially if you have been to the one you are using. Bonus points if it's Pebble or St. Andrews! Baller. The best tournament of the year. It also brings up the obligatory, "Have you been to the Masters?" question. And if the answer is yes, you are now the coolest person in your foursome—until you top your next tee shot. If you are a Masters fan (aka, a golf fan), this is the green jacket of ball markers. Note: Most patrons can't buy this marker at the tournament because the Masters doesn't sell Augusta National gear at the Masters—only Masters gear. To get ANGC markers, hats, shirts and $70 ties, you need access to the pro shop to the right of the first fairway. Good luck with that.